An article in the Wall St. Journal this past April titled “Watch out Sheepdogs, You may be replaced by a Drone” details the use of “quad-copter” drones to herd livestock and check on the condition of the animals. The drones being used cost around $500USD for off the shelf devices that include video cameras and remote viewing. Because these drones can fly, they can easily cover rough and hilly ground in their functions as livestock control and monitoring devices. The ranchers are using these drones to replace dogs and cowboys, both of which require feeding and their own maintenance, as well as pay in the case of the human workers. So the drones are providing a vital service at a very low cost. In the U.S., farmers are using video-equipped drones to gather information about their crops such as watering conditions, plant growth and health, and to help them schedule harvesting. Along with the use of GPS, farming is becoming increasingly a digital and IP industry. It is just a matter time and we could likely see the use of drones to extend electronic security systems and to investigate incidences in real time. There are a number of possible uses for flying drones in our industry. Drones could replace some human guards and provide campus-wide “Guard Tours” of commercial and educational facilities. When coordinated with VMS software and surveillance cameras, drones could be dispatched to investigate potential perimeter intrusions, providing a closer look that may help responders determine whether it was a human or an animal that jumped the fence. Hostile industrial locations are perfect candidates for drone usage, as they can potentially travel into areas that could be hazardous or uncomfortable for human responders. Drones will also be perfect tools for viewing emergency situations such as fires and chemical spills, along with public hostage-taking situations. While today’s drones have a limited flight time of around 20-25 minutes, we will likely see this technology improve and become cheaper, faster, and better. I believe that VMS software vendors will integrate drone responses into their systems, and security personnel will soon truly have roving eyes that can be quickly flown to an incident and deliver real-time video information. 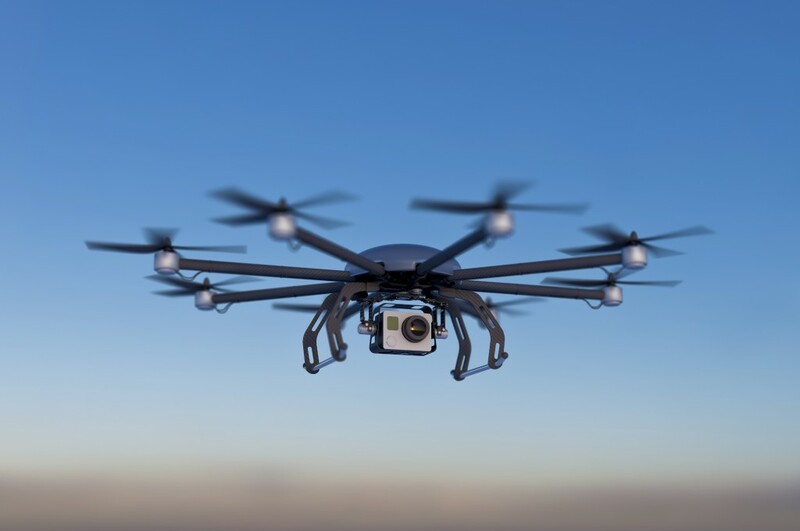 The future looks bright for drones in the security business. You could utilize a drone to capture the landscape of rough terrain, and get real time distance measurements for fiber optic cable runs. There are third party vendors that will incorporate the video to give the estimator a full 3D image of the sight to make more accurate estimates. Drones can also be utilized to survey difficult or hazardous locations, such as an offshore oil rig that needs video surveillance, helping system designers select usable camera locations and lenses. The possibilities are endless and adding this new technology to your estimating tool will just drive us to a whole new level of accuracy and possibilities.